What Are the "Things" in IoT? Remember WAY back when “technology” was the hot buzzword? Companies quickly jumped to incorporate it into their messaging, commercials, websites. The [company name withheld] Towel is made from a proprietary performance fabric that instantly cools when soaked with water, wrung out, and then snapped in the air to activate the cooling properties. The proprietary technology works by absorbing moisture and perspiration into the fabric core. But seriously… It’s a towel. Not a smart towel which send data back to your phone, or records your body temperature so you can ensure you’re not overheated. Just a towel. Quickly, the term technology evolved to a broader definition – “anything involving the application of scientific knowledge for practical purposes.” – Thanks Google. But in the last few years, we (as creators, consumers, managers of technology), have found our new hot phrase. IoT… The Internet of Things. If you Google that question (admit it, at some point in the last 5 years you have), you’ll get 217 million results. This ranges from articles which literally explain how devices connect to the internet and then to each other, all the way to abstract concepts around the rise of machines and how these devices will control the world around us making human interaction and contact obsolete. Fun stuff. This explosion of interest in IoT has really taken off the last 5 years and is searched almost a million times a month on Google. At Utopia, we prefer to think about IoT in terms of enablement of a fully-connected enterprise. Organizations have been using sensors, data collection software and other technology solutions for more than 40 years to monitor and track equipment, certain maintenance functions or individual parts of their supply chain operations. This baseline information collected provided a siloed view of one snapshot in time – but that’s all it was. The evolution from using data to monitor and report, to that of real-time access and predictive analytics is what fueled the quest for true connectivity. We see IoT as optimizing performance by enabling organizations to track, monitor and maintain fixed assets through their entire lifecycle – essentially building a network of connected asset data across all systems of record, and all functional locations. SO WHAT ARE THESE “THINGS” IN IoT? 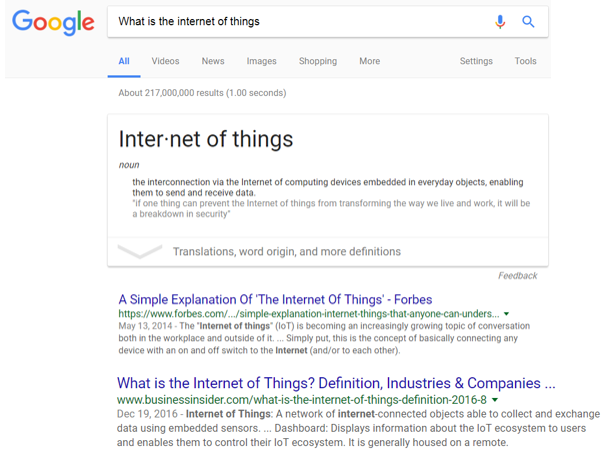 Interestingly enough, “things” has now been interpreted to mean literally everything – which is why you’ve started to see “Internet of Everything” pop up. Though IoE doesn’t quite have the same ring to it. But it’s true… If you’re connecting assets, whether that be physical objects or systems that are used to create, store and manage data – it’s IoT. Companies in asset-intensive industries can now access their technical and business data in real-time, through these connected digital devices. This means smart sensors, GIS systems, cars, jet engines, remote diagnostic equipment, machines, etc. can pump out real-time data. It’s instant availability which never used to exist. But what do you do with all the data? You need to leverage it through new technologies to access, understand, monitor and use it for more reliable decision-making across the business ecosystem. If you were at the SAP SAPPHIRE NOW & ASUG Annual Conference this year, you probably heard Leonardo mentioned a few literally hundreds of times. Leonardo is SAP’s Internet of Things Portfolio. They’ve created a suite which connects the ‘things’ in IoT with the people who use them and the operation processes they are a part of. This means an organization has the power to view, refine and enable end-to-end business processes, but also use that control to evolve new business models to run a digital enterprise. This is something we’re passionate about at Utopia – leveraging your most valuable assets to drive better business outcomes. It’s not enough for data to just exist, it must be nurtured, governed and CONNECTED to maximize its value. Its why we see IoT as just the beginning to achieving total digital transformation. And why Utopia’s “perfect data, perfectly possible” capabilities can be such a critical part of the IoT evolution.